In 1924, George Mallory made his third and final attempt at Everest. 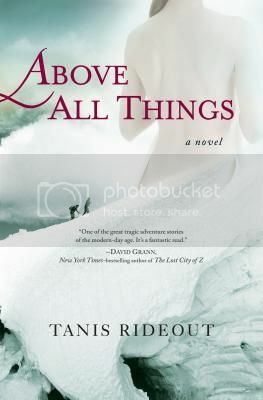 In Above All Things, Tanis Rideout tells the story of his last expedition by alternating between the experiences of the men on the mountain and those of Mallory’s wife, Ruth, waiting at home for news of her husband. I sort of wish that Above All Things could have been only from George Mallory’s point of view, as what was happening in his life was much flashier and more obviously interesting, but interspersing his climb with Ruth’s life serves the story Rideout is telling well. What really makes it work, in my opinion, is the time differential between Ruth and George’s accounts. Everything happening with George takes place a month or so before Ruth’s narrative – the amount of time it takes to get letters from Everest back home to England. This is a brilliant piece of plotting, as it synchronizes the end results of the mission for both of them. Above All Things is beautifully written, and it brings Mallory’s third Everest expedition to vividly to life.